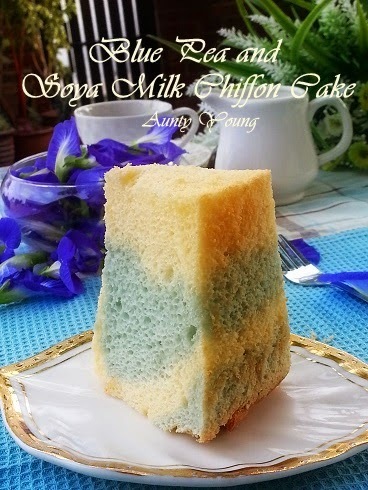 I really liked the Blue Pea and Soya Milk Ogura Cake I made the other day, and it occured to me, why not make a chiffon cake of the same flavor? 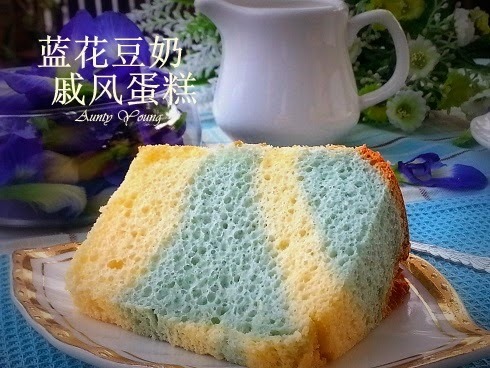 The strong aroma of soya milk mingles with the fluffy texture of the cake. Down it with a cup of fresh soy milk, ahhh! Marvelous! 1) Mix egg yolk, sugar, salt and honey using an electric mixer until even. 2) Mix in corn oil. Once evenly mixed, add in soy milk. 3) Sieve in cake flour and cornflour, then mix evenly into a yellow batter. 4) Divide the batter into 2 halves. Add the blue pea essence to one half to obtain blue pea batter, then add the vanilla essence to the other half. 5) Beat egg white and lemon juice and add in castor sugar in 3 parts. Beat until fluffy. 6) Divide the meringue into parts and fold into (4) part by part. 7) Once the meringue has been folded into both batter, pour them into the mould alternately. 8) Get rid of air bubbles by knocking the mould against a hard surface, then bake in a preheated oven at 170°C for about 50 minutes. 9) Remove the baked cake from the oven and immediately overturn it. Remove the mould after it has cooled. 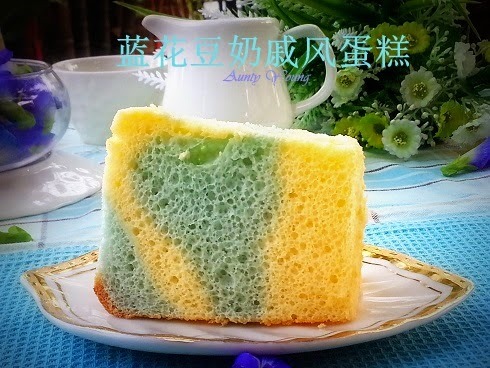 Hi Aunty Young, very sweet coloured chiffon cake, looks spongy soft. I'll try cos' I have the ingredients, lol. 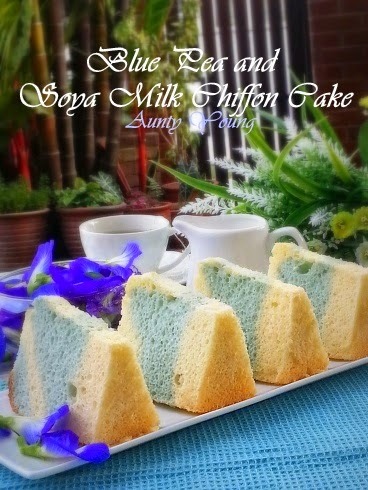 Aunty Young you are so creative, combining blue pea with soy milk. I can imagine the fragrance of the soy milk. Loved the texture too. 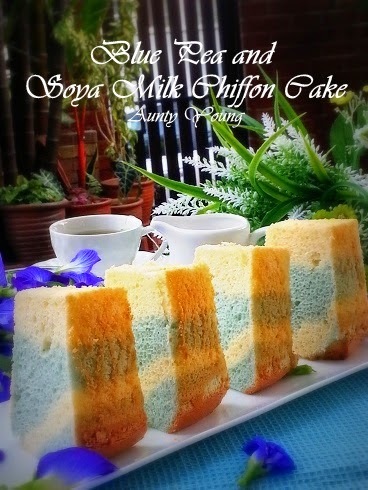 Love your chiffon cake with two pretty colours! Beautiful! 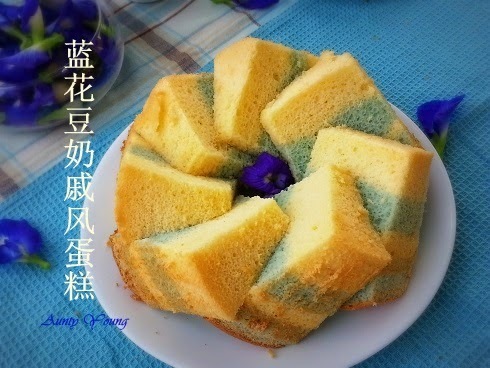 Aunty Young, the colour of your chiffon cake is really very sweet! aunty young, your chiffon is so beautiful! 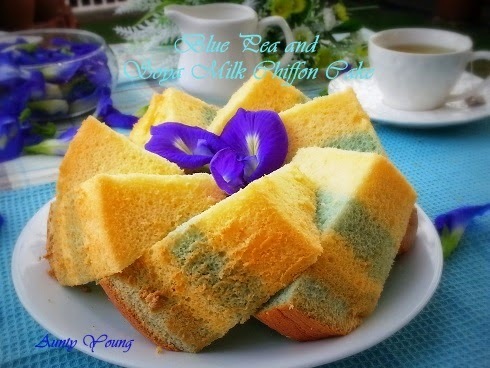 if I can get blue flowers, definitely gonna bake this, many likes! Such a pretty cake! I like the colours, make me smile just looking at the slices! what can i say? this 2 tone chiffon looks beautiful and the colour matches very well..and of course, i believe it tasted great too! thx for your submission again! Hi aunty young,how to reduce the ingredients if I have a 16cm tube pan? 16cm tube pan's volume is roughly 50% of the 20cm. So just reduce the ingredients in to half of portion. 3 egg white 45g sugar 1/2tsp lemon juice. 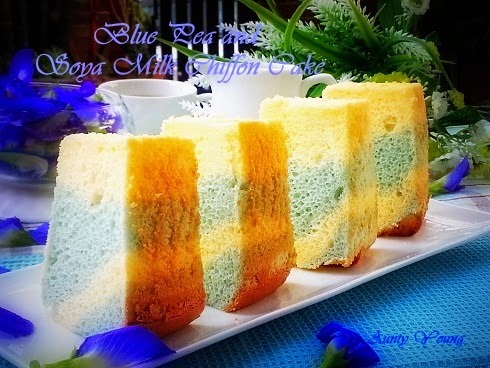 Hi aunty young, when u say take 20 blue pea mix 5tbsp water, do we pour all tis 5tbsp into the batter? Yesterday I try to do but batter was very watery. Hi Yong Chua, yes, just pour it all in. After you boil it in the microwave, the amount of liquid should be reduced to about 2 tbsp. Aunty Young, I don't have a microwave so I just put 20 pcs of blue pea in a bowl with 5tbsp water to soak. Is it after soaking, I scoop 2 tbsp of that blue water out? Hi Yong Chua, soaking the blue pea in water would not extract the colouring from the petals. If you don't have a microwave, you can always boil the blue pea and water together over a low flame and wait till the water turns a deep blue befroe removing 2tbsp to be used.